Since 1995 he was the chief designer and co-founder of the group of companies "Integrated Communication Systems". After 10 years of development of multifunctional communication devices and systems of paging communication he left the company in 2006 as CEO. Since 2007 - the chief designer in the "M2M telematics". Since 2012, he was a technical expert on the implementation of the navigation equipment GLONASS at the secretariat of the Deputy Prime Minister - Head of Government Staff. During the last two years working as a deputy president and technical director of Nonprofit Partnership "Promoting the development and use of navigation technologies" (NP "GLONASS"). 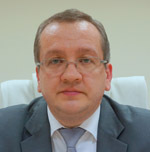 He has extensive technical expertise on the implementation of the navigation equipment GLONASS and experience of promotion of the technology, systems and services based on it on the markets of Russia and foreign countries. Author of more than 70 articles on the analysis of technical and economic efficiency of various communication systems, GLONASS and navigation.